Darren Naish has a new blog post on bird anatomy, Clubs, spurs spikes and claws on the hands of birds (part I). The focus is mainly on the pointy bits that don’t originate directly from the digits, but it’s the “normal” bits—claws—that fascinate me. Anyone into birds knows about the well-developed wing claws on digits I and II of young Hoatzins, but as Darren points out there are a lot of birds with wing claws, even chickens. Most people never notice them, though, because they’re so tiny. In chickens, the claw on digit I (the alula, homologous to our thumb) is reduced to an inconspicuous nubbin that’s easier to feel than to see (if you’re a carnivore, check for it the next time you cook a chicken). 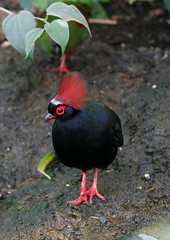 The first bird that I ever noticed a wing claw on was the Crested Wood-Partridge or Roul-roul. I had the privilege of getting to know these exquisite little birds back in the late 1970s when I worked as a zookeeper. A pair that lived in the rainforest exhibit of the bird house occasionally produced eggs, and with artificial incubation one of these produced a chick. The normal procedure for precocial chicks was to place them in a plywood brooder box with a heat lamp, some gamebird starter mash with chopped lettuce garnish, and a drown-proof waterer and just leave them alone. This works fine with your average gallinaceous bird, but Roul-rouls are not your average gallinaceous bird. “Roulettes” are fed by their parents for the first few days of life, and since the parents in this case weren’t involved, this job fell to me. Several times a day I would get the chick out of its box, place it on the bird house’s kitchen counter, and present it with succulent morsels of greens, fruit, boiled egg, and chopped mealworm. It was on the first of these close encounters that I noticed something hard and shiny protruding from the leading edge of the roulette’s wing: a long, curved black claw. I was stunned. It could have been a kitten’s claw, except that it was sticking out of a bird’s wing. Up to that moment in my young life, the evolution of birds had been an abstract concept, based on evidence with which I had a basic familiarity but no personal experience. Seeing the wing claw on the Roul-roul chick was like being smacked upside the head with evolution. Roul-rouls spend their days on the ground but roost in trees. I wonder if, like the young Hoatzin, the Roulette’s wing claws help it navigate the third dimension of its rapidly vanishing tropical forest home? You cannot reason a person out of a position he did not reason himself into in the first place. It was too good to last. 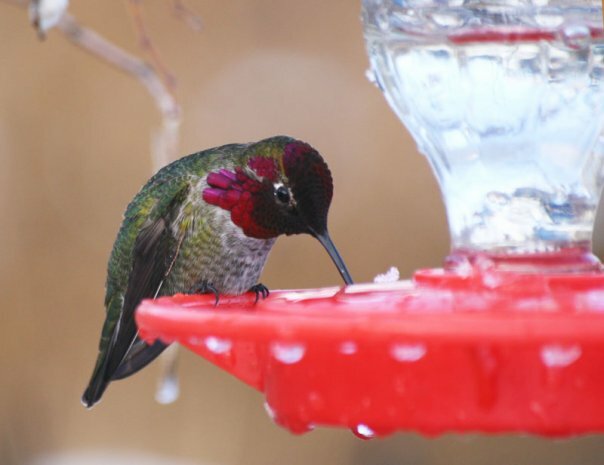 After four years of keeping under the radar, Montana wildlife rehabilitator Judy Hoy is once again warning the public about the evils of perches on hummingbird feeders. If the outside temperature is below 50[° F.] and the sugar water is cold, the birds can become completely hypothermic after drinking two crops full without flying. They then fall to the ground and eventually die from cold and lack of food or are eaten by magpies, cats or other predators. Hover-feeding isn’t a problem, she says, because the muscle action helps to warm the bird’s body. You may get the impression from this post that I am running out of patience with stupidity and I am! By her own account, Hoy started her anti-perch campaign in 1985. A quarter of a century is plenty of time to gather an enormous amount of support for her claims, so where is it? Despite repeated requests from skeptics, she hasn’t produced any photos, videos, necropsy results, or other objective evidence to demonstrate that feeder perches cause hypothermia in otherwise normal, healthy hummingbirds. Instead, she continues to rely on anecdotes, opinions, and misinterpretations of cherry-picked scientific research, ignoring more relevant research that refutes her claims. Over the same 25-year period, people who host wintering hummingbirds have amassed hundreds of thousands of observations of birds perching to feed when the temperatures of both the air and the sugar water are well below freezing (20 degrees or more colder than Hoy’s hypothetical hypothermia threshold), and showing absolutely no ill effects. Additionally, hummingbird banders in the southeastern U.S. have documented hundreds of hummingbirds, including Rufous and Calliope, returning year after year to the same wintering sites. Many of these birds take their first sips of frosty sugar-water every winter morning while resting on feeder perches. Though this doesn’t “disprove” Hoy’s perch hypothermia claims, it does strongly suggest that it’s at worst an extremely rare cause of mortality. None of this seems to make a dent in Hoy’s belief. She responded to these challenges by adding increasingly elaborate and often conflicting justifications for the lack of independent verification: most people never see hypothermic hummingbirds because predators get them first, it happens mostly in “Canada, North Eastern States and…Western Montana,” Rufous are particularly cold-sensitive (! ), different species have significantly different “thermodynamics,” pesticides and herbicides sprayed in her area damaged their mitochondria and/or thyroid function. Unlike Hoy, I don’t expect anyone to take my word on something without evidence. That’s why I wrote a detailed analysis of perch hypothermia way back in 2006, after a message she posted to an online discussion group was forwarded to other groups by well-meaning participants. At Hoy’s request, I sent her all of the evidence refuting her claims, with faint hope that we might lay perch hypothermia to rest once and for all. No such luck. Like True Believers® in so many other crackpot ideas (young-earth creationism, alien abductions, “rods,” homeopathy, etc. ), Hoy’s faith is unshakable. …Rufous and Calliope are now on Audubon’s red list. Nope. Both species were listed on the 2002 Audubon Watchlist as yellow (declining), not red (declining rapidly). The 2007 Watchlist includes only the Calliope, still in the yellow category. It’s disappointing, but far from surprising, that even her “new” information is both overstated and outdated. and support habitat conservation and restoration. And if you’re still worried about “perch hypothermia,” make your feeder solution richer (3:1 instead of 4:1) during cold weather so that the birds have to take in less cold solution to get the same amount of energy.